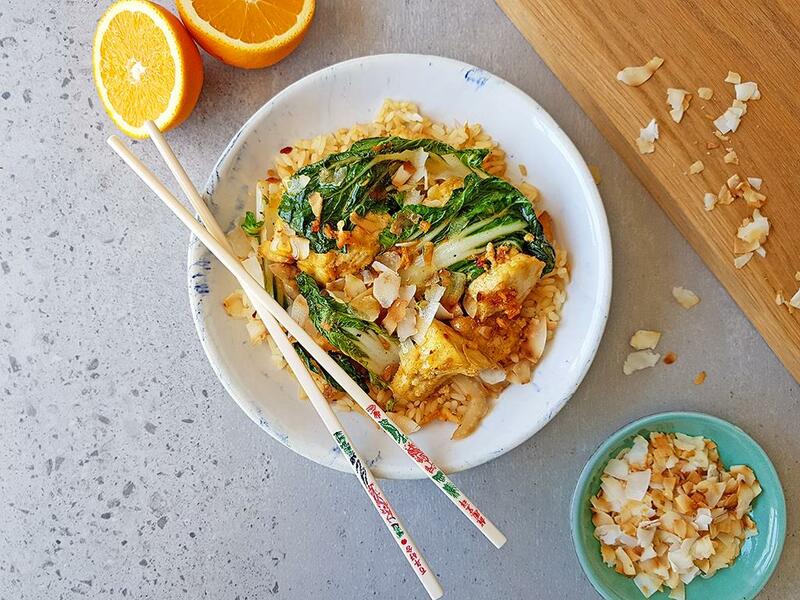 Roasted tofu coated in an orange, ginger & soy sauce with brown rice & pak choi, topped with coconut flakes. Orange: Using the fine side of a box grater, grate the peel to create zest. Cut in half and juice. Tofu: Place on a tin foil lined baking tray with a drizzle of olive oil and season with salt and pepper. Roast for 15 minutes until golden. Sauce: Mix together the orange zest and juice, sugar, ginger, garlic, chilli flakes (optional) and soy sauce. Coconut flakes: Toast in a dry pan for 1-2 minutes on a high heat. Remove and set aside. Sauce: In the same pan you, on high heat, add the sauce and cook for 20 seconds, stirring. Remove and divide the mixture into 2 bowls. Mix one bowl through the rice and the other bowl through the tofu. Pak choi: Using the same pan, on high heat, sauté the pak choi stalks for 2 minutes. Add the leaves, season with salt and cook for another 2 minutes until wilted. Serve: the rice topped with the tofu, pak choi leaves and stems and toasted coconut flakes. "Was it easy to prepare? Yes, very easy to prepare. Was there enough food? Lovely portion size. Were the instructions easy to follow? Yes, very easy to follow. Next time I would add more chilli as I like more heat to the dish Loved the sauce on the rice, would do that again for other dishes. First time grilling tofu for me, so I would probably break into smaller pieces next time and let it go a little longer so that it goes a bit crispier, was also toying with the idea of putting sauce on and tossing back under the grill for a minute. "